The commencement ceremony is an important rite of passage, marking the end of one stage and the beginning of another. While it serves to recognize graduates for their hard work and achievement, the ceremony also gives recognition to those who have supported the graduate and have made this achievement possible. It is an exciting time for your school, graduates, and families. Although the commencement and the moments surrounding it are fleeting, the memories may be preserved for years to come. Therefore, capturing these special moments is a once in a lifetime opportunity. 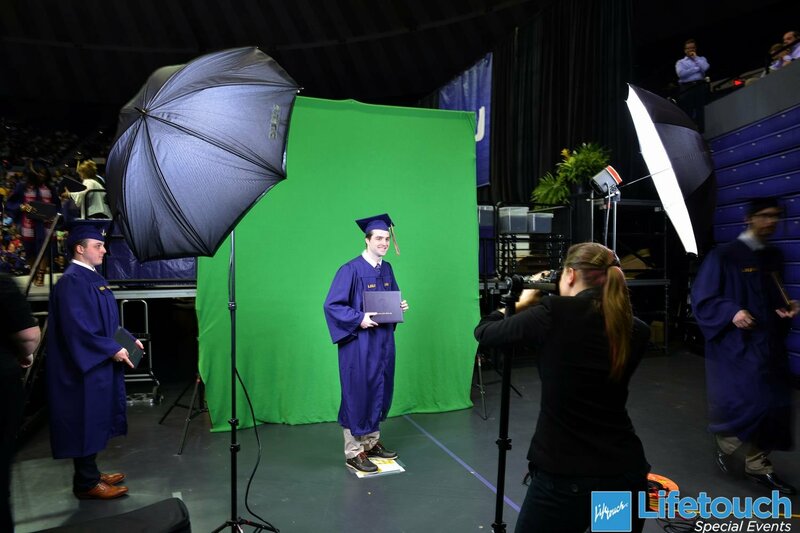 The Lifetouch Commencement program offers total event coverage, including a minimum of two images per graduate: an individual portrait, and a handshake portrait. This provides many choices for both the graduate and their family, allowing for each graduate’s story to be told in a more complete and meaningful way than the traditional single handshake photograph. By using a green screen backdrop in our production process, Lifetouch can incorporate a campus icon or a custom background that changes annually. Graduates receive a variety of background choices by stopping only once in front of the camera. We incorporate our client's ideas into our process to make truly unique graduation day keepsakes.